How do you adjust RF power output in digital modes like FT8 and PSK31? In the Icom manual it states, “When operating in the SSB data mode, adjust the device’s output level to be within the ALC zone.” So contrary to the old rule that ALC fluctuation is bad, that is not the case with these new SDR transceivers. I had been adjusting my power mostly with the PWR slider in some of the software programs I use. That is a good way and works perfectly fine, but the ALC will adjust too. Here’s a way to keep a consistent ALC and maintain a clean signal. Use your own judgement as to how much ALC is sufficient. Both transceivers are very similar. 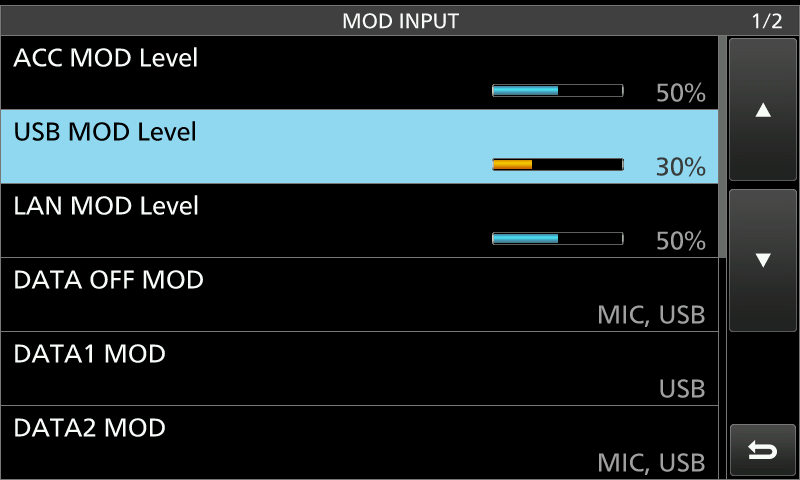 The first setting to look at is the USB MOD Level. Currently mine is set to 30% in the 7610. It works well with all of the software programs I use, Ham Radio Deluxe DM780, WSJT-X, WinWarbler and Fldigi. In the 7300 it is in Menu>Set>Connectors. Look for USB MOD Level. Try around 40% in this radio. In the Icom 7610 go one menu deeper to MOD INPUT. Try around 30%. This is where the RF power is adjusted and it’s the only setting needed to increase or decrease RF power output. Using this method the ALC will stay the same whether running 10 watts, 50 watts or 100 watts. Push the MULTI knob and select RF POWER with the touch of a finger. Rotate the MULTI knob and set you RF power to the desired setting. Mine is normally around 30% and I get 30 watts output. One more important setting for those using Windows machines. 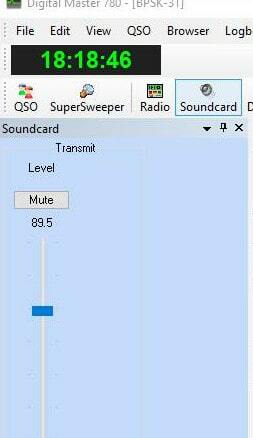 Set the Speaker Level in Windows to 50. This 50 works great with all the software I use for digital modes. In Windows Right-click the Speaker icon in the Windows taskbar, select Playback devices, double-click the USB Audio CODEC, select the Levels tab and adjust the Speakers to 50. All of these adjustments are in the video below. We will only use the Pwr slider in WSJT-X to adjust and set the ALC. My slider is almost to the top of the scale. This puts my ALC at approximately 1/2 scale in the ALC zone on the radio when I transmit. Adjust yours when tuning (using the Tune button) and keep the ALC between 1/2 and 3/4 scale in the ALC zone. We won’t need to touch this again unless there’s a change in the radios USB MOD Level or the Windows Speaker Level in the USB Audio CODEC. The slider is almost to the top of the scale. Adjust it for 1/2 to 3/4 ALC in the ALC zone while transmitting. We won’t need to touch this again. WinWarbler doesn’t have a visible RF power slider like WSJT-X and DM780. It uses the Windows Speaker Levels setting in the USB Audio CODEC. Like WinWarbler, Fldigi doesn’t have a visible RF Power slider. To adjust and set the RF Power just use the MULTI knob on the Icom 7300 and Icom 7610. It doesn’t matter if you run 10 watts, 50 watts or 100 watts, the ALC will be consistent. This is the beauty of this method and according to the manual and the Icom experts having ALC within the ALC zone is not a bad thing, but really what we should be looking for. The video below covers everything in this article and shows an example of good and bad signals using the Icom 7610 Audio Scope. Your setting for the USB MOD Level may differ slightly to get the optimum ALC for each software program you use. Experiment a little. Many have reported the Icom 7300 and 7610 can still maintain a clean signal with the ALC at max of the ALC scale. I have chosen to stay within the ALC zone between 1/2 and 3/4 scale. Others report 1/3 scale is best for them and they maintain a clean signal. Experiment a little. There are different ways to adjust the RF power, but if you want to maintain a consistent ALC, try this method. You may still prefer to use the RF power slider in the software like many Hams and there is nothing wrong with that. Some Hams will prefer to use the software and some will like using the MULTI knob on the transceiver. Great Marc. Good catch. Hopefully your SWR is stable. I use auto when I am portable because I am not using an amp. I have only used it on SSB and I kinda like it. Great to hear from you and thank you for posting your solution. As always thanks for all your hard work putting this site/blog together. Just one q: when you talk about the ALC zone on the 7300 do you mean the red zone on the ALC scale or the whole scale? Thanks Rich – that’s great. I’m on about 50% of the red scale and all seems well! I just followed your suggestions made in the tutorial/article, and it all works fine on my IC-7610, for the bands above 40m. It all stays more or less consistent on all bands with the exception of 40 & 80 meters, where the power drops down to just 20 – 25 Wts. Any idea what I did wrong? I’d like to push out at a similar amount of power like on the other higher frequency bands. Any hint would be appriciated. When the power drops, how is your SWR? thanks for your feedback. Yes, it had a high SWR. And I noticed something strange there. My antenna is tuned (using the 7610 internal tuner) to 7.074, doing a few FT8 QSOs. I noticed that I have to re-tune every, lets say 2-3 QSOs, since the tuner doesnt seem to keep the settings for this antenna at the selected frequency. Any idea why this is the case? From my understanding, the tuner should consistently keep the settings until being tuned next time, right? Thank you so much. It should keep the setting. It could be the a grounding problem, antenna, ant. connectors, coax, etc., etc., causing problems. I’ve seen my antenna behave the same and one time it was water in a connector after a bad storm. think I have found what was causing the issue. During experimentation, I had PTT Start (Menu->Set->Function->Tuner), set to ON. Once I set it back to OFF, the issue was gone and the tuner settings were stable, as expected. ICOM says that when in USB-D mode the output level of the IC 7300 should be within the ALC zone. Is this also valid when the IC 7300 is in RTTY mode? no other (logging) program connected. With RF Power set on 30% the ALC was about 3/4 of the scale, so a rather high ALC reading. (Output reading on my external Kenwood AT-230: about 20 watts). With RF Power set on 5% the ALC still was 1/2 of the scale. IC-7300 settings: ACC/USB Output Level 40%, USB Mod Level 40%, USB Send: RTS, USB Keying RTTY: DTR. I tried some other settings but the ALC didn’t change a lot. Any suggestions to get the ALC down (if needed)? Is there a setting in MMTTY which can do the trick? Today I also tried a setup with FLDIGI in mode RTTY (AFSK) and the 7300 in USB-D mode. 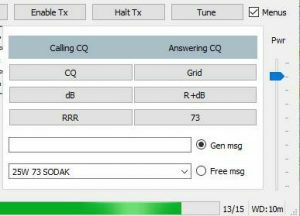 IC-7300 settings the same as above, but USB-Send: Off. Windows USB-Audio Codec settings each on 50%. In this case the ALC stayed low (only 2 or 3 little bars on the ALC-scale) with RF power at 30%. It seems to me one has more control on the ALC when using FLDIGI (RTTY / AFSK) combined with a proper setting of the USB-Audio Codec level. This compared with MMTTY (FSK). Your opinion? Nice to hear from you and thank you for the comment and questions. Very good questions. In RTTY (FSK) mode the ALC will not change much. It’s full out, so don’t be concerned about it. It will change slightly if adjusting the PO. When I am on RTTY FSK I usually run 80 to 100 watts. No problems at all. In contests I’ve used my Ameritron amp, but I have to be careful and watch both the radio and amp closely. You nailed it. When in RTTY (AFSK) you can adjust the ALC and power as if you are running PSK31. It’s nice with Fldigi. Sounds like you have it going very nicely. Thank you again and again very nice to hear from you. Thank you for your quick and reassuring reply, I was concerned about the high ALC when using MMTTY. I only started in digital modes about 6 weeks ago, when my new IC 7300 arrived. With the help of your informative website and videos getting started was rather easy. 1. In WSJT-X sometimes the 7300 would not switch from Tx to Rx and I had some rig control error messages. Restarting WSJT-X was then the only solution. This was solved by setting the 7300 ‘USB Send’ to OFF (it is only set to RTS when using MMTTY). USB cable, I now use a well shielded one. It is unusual for WSJT-X to do that (1.). Maybe you can just leave USB Send OFF for MMTTY. The RTTY Keying can be done by DTR. I have some garbage in my spectrum scope too sometimes. Thank you for your solution. Best wishes to you and yours. Thank you so much and best 73. Well I made the final selection…. Flex 6400M vs IC-7610. I now have the big brother to my 7300, the 7610. Nice to hear from you. Congrats on the 7610! I have a new video and it show WSJT-X towards the end and how it is configured. I am just running it and nothing else. I will have to look at the video. Maybe they are using dual watch with WSJT-X? I am having issues with WSJT-X on 20 and 15m. With your settings I am not getting any ALC or watts out. All other bands work fine. I tested by transmitting a CQ in FT8 into a dummy load. Have you experienced this issue or heard of it? Nice to hear from you and thank you for visiting my website. I have not had that happen. Will the radio TX when you hit “Tune” in WSJT-X? I have tested the CAT and PTT in WSJT-X and it works so it shows that the USB settings are correct. If I use the Tune feature in WSJT-X I get ALC deflection and power out on all bands. Then I tested into a dummy load and I get between 50-75% deflection on the ALC and my Bird meter shows the correct output power on all bands except 15 and 20m which so no ALC and no output power. I cannot figure it out. I have loaded the latest Icom drivers (downloaded yesterday) and I have triple checked every settings in the radio, application and Windows and all match what you have in place. I have even crossed referenced them with other articles which basically say the same as you. I would understand if all the bands didn’t work but just these two, which is unfortunate since 20m is the only really active band other than 40 here. So if I understand you right, tune works with power output on 15 and 20m, but no power output when transmitting CQ. I use tune briefly to set my power output level and then I make a transmission. My transmission is the same power output as what I set with tune. That is unusual. Are you sure WSJT-X has the correct frequency in 15m and 20m and you are in USB-D? Using another program, could you try PSK31 on 15 and 20m? Well Rich, when all else fails blow everything away and start over. So to answer your questions. Your first sentence is correct. All other bands worked fine but 15 & 20. Everything you mentioned in your 3rd sentence was set correctly. Using Winwarbler I could send PSK31 and using MMTTY I could send RTTY. So I reset the the radio back to default, uninstalled WSJT-X and wiped any reference in the registry, removed the Icom drivers and rebooted the machine. I then reinstalled the application and driver. I configured the radio and all worked as it should. Not sure what happened. I have read a couple of posts that stated that the sound card in the 7300 gets confused at times and quits functioning. I also read that the latest firmware update resolved the issue. I have had the latest update installed for a while so either it does not resolve the issue or something else was going on. Made several contacts last night on 20m FT8 without issue. Prior to the issues on 15 & 20 everything worked ok and then in the middle of working FT8 it just quit which set me off on the troubleshooting path. I am going to watch it closely and see if it happens again. By the way nothing was changed in settings on the radio, application or computer from when it was working to when it stopped. That is why it was just so confusing and frustrating. Thanks for the help. I enjoy your videos, keep up the good work. Thanks for taking time and commenting on how you resolved it. I’m happy to hear you got it working again. Another Ham I know just had to uninstall and install the driver to get his working, but he was unable to TX on any band with WSJT-X. However DM780 and PSK31 worked fine for him. Your situation is unusual in that it was an issue with just 15 and 20m. Thank you again, your post will be of help to others. Power output is always set to 100W on my IC-7300. It’s in HRD DM780 (BPSK31), SIM31 and WSJT-X programs, I’m adjusting Tx audio level to control the output power, for example to zero ALC display, when running BPSK31 and so on. Adjust the ALC meter to 0 % of the ALC scale when running PSK31/63/125 if you want to send a clean signal (-34 IMD), with no visible unwanted sidebar pairs. This is measured with my outstanding KK7UQ IMD meter. I use nearly the same IC-7300 menu, but if only two bars appear in the ALC display, my IMD changes from -34dB to about -18-20dB measured with my kk7uq IMD meter. With radio set to 100 % RF Power, I have approx. 60W out at 0 % ALC display. In analogue SSTV (MMSSTV) my ALC scale shows approx. 100 % at 100W output. Thank you so much for reposting and again, it’s nice to hear from you. You have a very nice looking Icom 7300 page. That was my preferred way for a long time and I much appreciate your posting that information. I look very much to seeing you on FT8 someday. Best 73! Thank you for the informative article. I have wondered about the ALC setting and in my own use of the 7300, I have reduced the audio feed to just engage the ALC. then, as you suggest, adjust the power output with the multicontrol. I guess my approach on level control is « when in doubt, leave it out » I know this is an old school approach and may or may not be Valid. My fear is that every additional audio stage introduces some element of distortion. Again , old school thinking but I still think that way HiHi. I wonder what Icom’s reason is for suggesting such a high level of ALC? Nice to hear from you and that is my thinking too, it’s better to be safe. The 7300 and 7610 are not like the traditional transceivers. Basically, they process the signal different than traditional transceivers. AB4OJ has an excellent report on it. See IC-7300 User Evaluation & Test Report. Many of the Hams I know using the 7300 and 7610 report no distortion at 50% ALC and a few others have even commented to me that 100% is good. I think it is better to be safe, so I’ll stay around 50%. Icom just says within the ALC zone. I noticed that I didn’t have to use as much power when my ALC was 50% of the scale. It could have just been propagation, but I was impressed going from 30 watts to 15 watts and getting very good reports on FT8 and PSK31. Thank you again and I hope to hear (see) you on the air. Thanks for a great article. On my 7300, I have the RF Output set to 50% (50 watts), my Audio Codec output set to 22 and my Acc USB AF output set to 75%. With those settings my ALC is still 0. Took a lot of fussing to get there – nice to know ALC doesn’t have to be 0. What is the function of CI V echo back ON – I have had mine off? Just before the article posted I was testing the 7300 settings and it is a little different than the Icom 7610. I needed to adjust the USB MOD Level to 40% or a little more to achieve what I was doing with the 7610 at 30%. I also noticed the 7300 still has a little fluctuation in ALC when going from 20 watts to 70 watts using the RF Power (MULTI) knob. So it is a little fussier than the 7610. No doubt settings will vary from station to station. I ran no ALC for a long time on the 7300 and I made a lot of contacts and got good reports which I am sure you are getting. No distortion. The CI-V Echo back is needed for some of the programs I am using. Particularly MacLoggerDX a while back. There was another too, but I can’t think of it now. The default OFF works for most everything and having it ON doesn’t seem to affect much but a couple of programs that I’ve seen. If you don’t have any problems, stick with it OFF. Thanks for commenting and your information, I appreciate it.